If you’re looking for something to do this Thanksgiving with your family, Silver Oak has your game. Today, we’re looking at the best casino games — slots, video poker and beyond — that are sure to get you in the Thanksgiving spirit. So make sure you’ve got your laptop or mobile device handy wherever you’re celebrating Thanksgiving. Remember, you need to be over 21 to play at Silver Oak Casino, so keep that in mind. If nothing says Thanksgiving Thursday like an entire day of football, then fire up your Mac or PC and sign into your Silver Oak Casino account. Sure, you can watch the Eagles take on the Lions, the Bears battle the Packers, or the Panthers face the Cowboys on the new 80” TV you scored for $430 at a Black Friday sale. 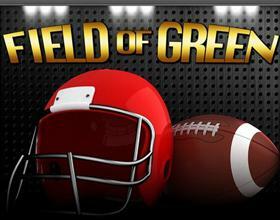 Or you could play a fun football-themed online slots game at Silver Oak Casino. The 20-payline slots game includes free spins, field goal opportunities, and so much more to make you feel like you’ve won the big match. Thanksgiving is all about giving thanks for our freedom and celebrating America. Why not celebrate it while playing video poker? And not just any video poker. At Silver Oak Casino, we’ve got All American Poker, a stars and stripes-themed game that includes a double or nothing bonus round. As soon as your turkey-induced coma wears off, you’ll be hungry for another big feast, but that likely won’t roll around until Christmas. But if you’re in the mood (and who isn’t right after Thanksgiving) play Naughty or Nice, a fun online slots games where Santa’s helpers are way hotter than Santa coming down a lit fireplace. If you missed scoring a new purse, $1 hoodies, shoes for 90% off, or dirt-cheap jewelry that truly sparkles, don’t worry about it. Just play High Fashion, the online slots of game with two big jackpots, including a $1,000 major jackpot and a $250 minor jackpot. Who knows? You could end up winning enough money to buy all your favorite stuff, even after the Black Friday sales are over. When you’ve been stuffing your face with pumpkin pie and enjoying cocktails throughout the weekend, the last thing you want to do is think hard about your gambling endeavors. But that doesn’t mean you have to steer clear of table games. There’s more to the felt than just Blackjack and Baccarat. Give War a chance. It’s you against the dealer and high card wins. Get the same card and you’ll go to war. It’s that easy. Ready for a Thanksgiving you’ll never forget? You’ll need a free Silver Oak Casino account to get started. With your username and password, you can access the full suite of casino games on your Windows PC, including a whole bunch of live dealer games. If you’re on a Mac, you can access the Instant Play version through your web browser, where over 150 of your favorite online casino games are waiting for you. And if you’re going to be at Grandma’s for dinner, don’t forget your smartphone or tablet. It’s your ticket to having a blast and winning big.